I’m going to be started work soon (within the next couple of weeks) on my first solo PDF, I’ve been published in a book joint-authored by Johnn Four and myself (Mythic Gods & Monsters) but in that I wrote content, Johnn handled the layout, posting the pub to leanpub and pretty much everything else (and did an excellent job); this will be the first time I’ve actually published anything entirely as a solo effort. When I was thinking about what I wanted to do for the publication I turned to my favourite system Fate; initially I thought about doing a ‘world’ supplement (and may still get around to doing that later) but I really wanted something that a lot of people could just pick and use and that would immediately be useful in their games. Aspects are one of the core mechanics in Fate and are used to define everything from momentary advantages, to significant parts of a characters background, signature equipment and even interesting parts of the terrain or environment; however, it’s also a mechanic that a lot of people have expressed confusion about or find bewildering. I can understand this, after all, being confronted with a game mechanic that relies on description and that you can feasibly do almost anything with can be a little overwhelming. An analogy I’ve often used is the if an artist is giving a blank canvas and told ‘paint me something, anything’ it can often be difficult to get started since there are so many possibilities, however if they are given a bit of guidance or once they are over that initial hurdle it can be a lot easier to begin the act of creation. This is what I want to do with my PDF, provide some structure and ideas that can be taken and used in people’s game to speed up creation of Aspects without unnecessarily restricting the. One of the things I’ve picked up whilst writing for Johnn Four is that he’s very much a fan of articles that provide content that GMs can take and use in their game rather than in more general advice; this is something I greatly respect since there is a lot of general advice out there (not that this is a bad thing, I enjoy giving advice on my Youtube Channel), if I’m going to create a PDF then I want it to be something that has a use. A brief explanation of how the aspect mechanic works and some suggestions for incorporating it into non-Fate games. This will be the introductory chapter of the book. The main meat of the book will be a number of madlibs that provide a basic structure for an aspect you can then plug in words and phrases related to specific genres; each of these will be provided in tables so that people can roll on them if they want a random outcome, or they can simply make choices if they are using them as a starting off point.For example: A high concept madlib might go I am a [ occupation ] who [ event ] until [ traumatic event ]; you could then plug any number of different words/phrases into the madlib.I am a disheartened academic who researched the occult until I read from the forbidden tome.I am a savage warrior who spend years mastering the sword until my home village was destroyed by marauders. I’m hoping that I can feature a number of tables that have general suggestions as well as some that are more genre specific; for instance, whilst there are almost as many savage warriors in sci-fi as their are in fantasy, the same is not true of sorcerors. Each of the entries in the book will have suggestions for how they can be compelled/invoked as an aid to players and GMs, and also some suggestions for tailoring them for different types of game. Given that this is my first solo-effort in regards to publishing, I’m not entirely certain how long the PDF is going to take to write and I’m pretty much doing it as a one-man-band both because the issue with aspects is something that a number of people have mentioned to me, and also because I want to see whether it is going to be feasible for me to release more solo stuff in future. Hopefully once it’s done I’ll be posting it for purchase (on a PWYW basis) on each Leanpub or Drivethru RPG (once I’ve looked into their processes a little more). Circuit board tree image designed by Mastermindsro, you can see the full design here; used under the Creative Commons Attribution 2.0 Generic license. In his excellent podcast The Lounge, Misdirected Mark Productions interviews Johnn Four (the mastermind behind the excellent RPT newsletter that I contribute articles to) where they discuss a lot of things about RPGs, including mythology and the recent Mythic Gods & Monsters books co-authored by Johnn and myself. You can find a link to the podcast here. 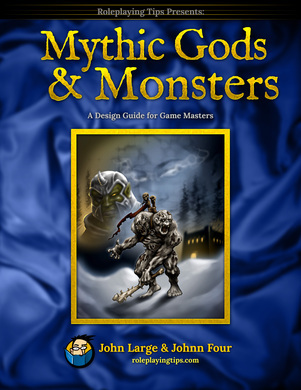 A guidebook for game masters on how to create mythic gods and mythic monsters that meddle in the lives of the player characters. This book makes filling out a pantheon with unique and interesting gods fast and easy. It then arms GMs with the tool to make mythic monsters to challenge PCs with. [Handout-RPG] Some initial thoughts about making a handout for my Jadepunk game. And a very interesting article that I read on Johnn Four’s Gamesmaster Tips website (http://www.roleplayingtips.com/rpt-7-save-time-get-planning-done-campaign-newsletters/) about creating a newsletter for an RPG campaign I decided to float the idea of doing something similar for our Jadepunk campaign past my players (since i’m always banging the drum about getting ideas and collaborating with your players). Since our game is normally going to run every other week on Sunday evening (although we’re having to juggle schedules a bit at the moment given the inevitable busiest of the festive/New Year period), i’m going to start trying to put out a 1 or 2 page newsletter the weekend after a session, this will not only give the players a week to read and digest the contents but will also encourage me to have stuff planned for the session a little in advance rather than leaving everything to the last minute (as I have been sometimes known to do). My current plan is to save the newsletter as a PDF, upload it to my Google Drive and then make the links for the various issues available to the players (I may also publish them on this blog if there’s any interest in people seeing them). If anyone else has any experience (good or bad) with using campaign newsletters, let me know in the comments, i’d especially be interested to hear about the sort of things you put in a newsletter.